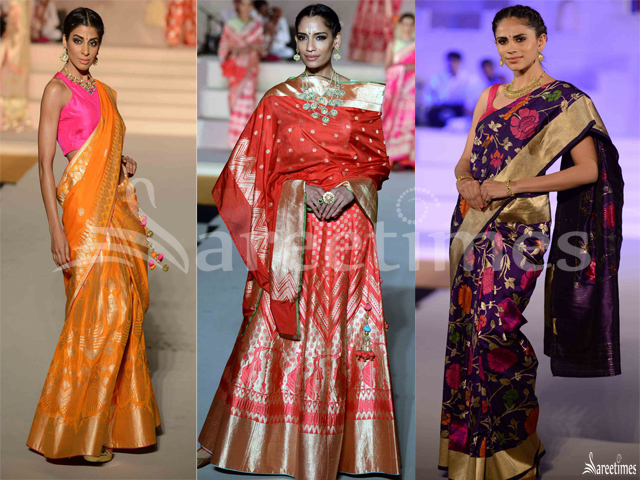 Fashion models displaying traditional Banaras sarees at Threads of Benares fashion show. 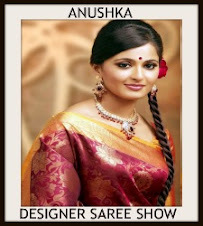 Fashion models displaying designer sarees by Mayyur Girotra at Gionee India Beach Fashion Week. 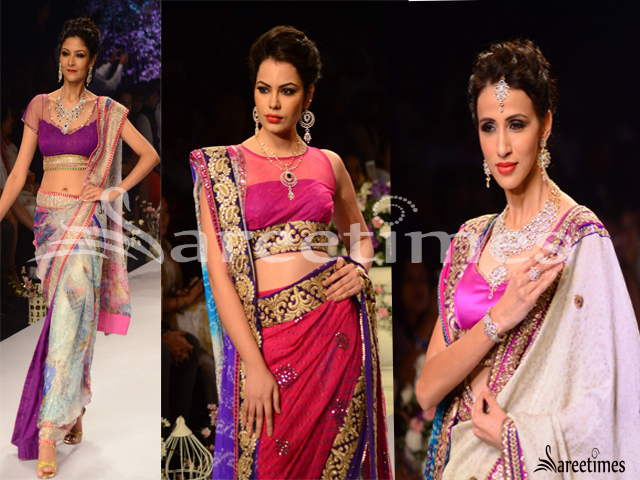 Models displaying designer sarees by Anushree Reddy at Lakme Fashion week 2015. 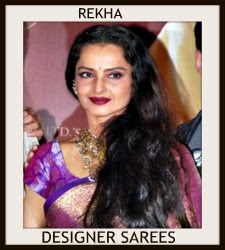 Fashion models displaying designer sarees at India International Jewellery Week. 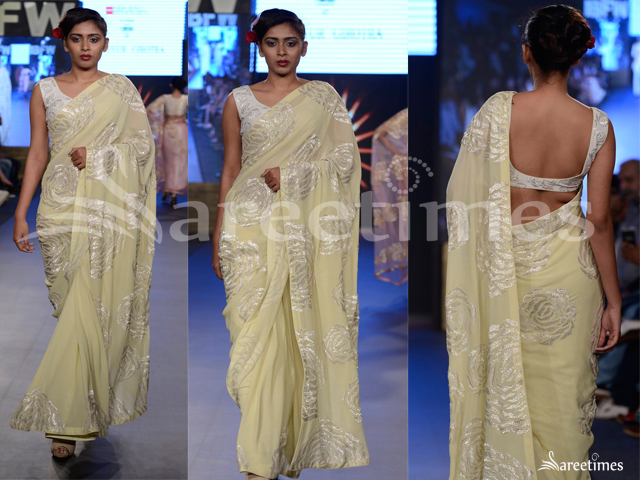 Nadhiya in Madras Bridal Fashion Show wearing a yellow work lehenga in half saree style. 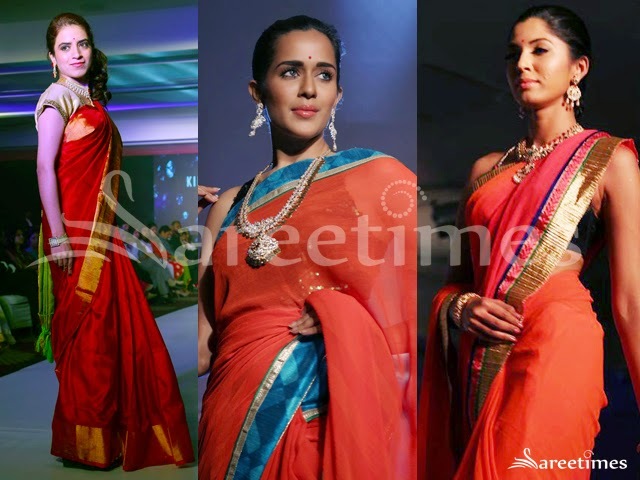 Fashion Models displaying designer sarees at Madras Bridal Fashion Show 2015. 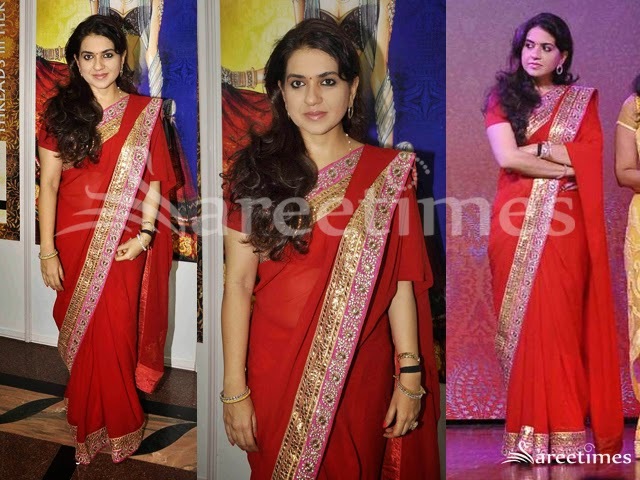 Fashion Designer Shaina NC at Somani Fashion Show in red embroidery work saree. 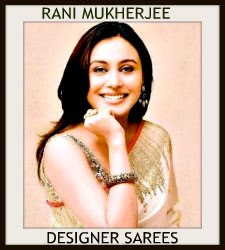 Short sleeved blouse paired with zari border. 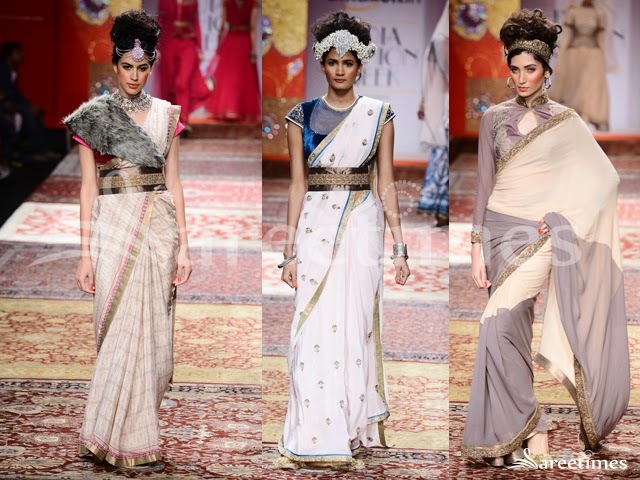 Fashion models in designer sarees by PIA Pauro at Amazon India fashion week. 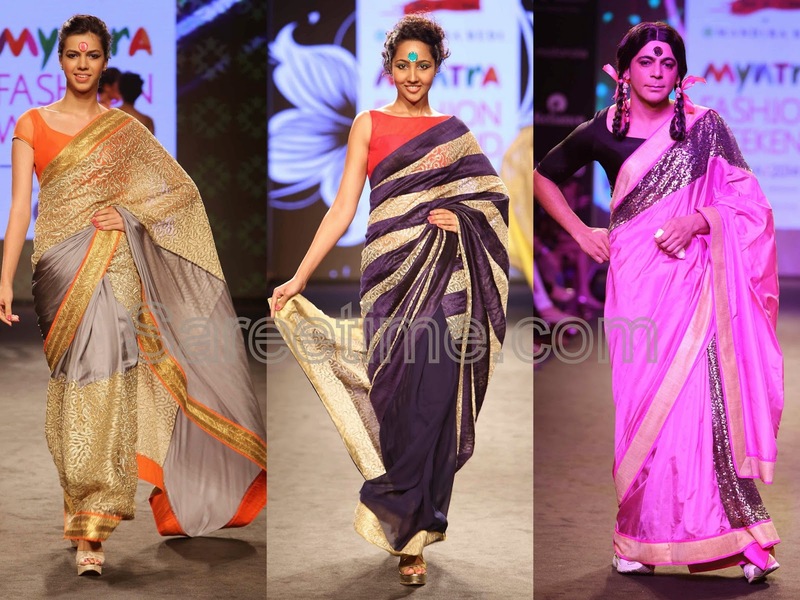 Fashion models in designer sarees by JJ Valaya at Amazon India fashion week. 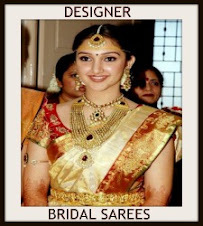 Actress Ileana attending a fashion show in Dubai wearing a printed saree designed by Satya Paul. 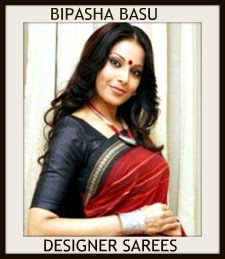 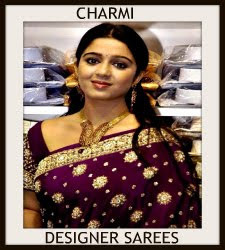 The Saree had a blend of colors that included yellow, red, black, white, pink and blue. 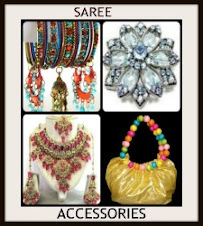 Paired with sleeveless V necked blouse. 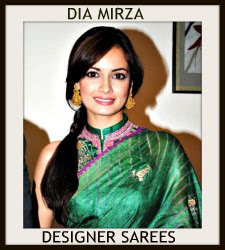 Actress Dipannita Sharma at Zoya/JJ Valaya fashion show and dinner wearing a Vaishali S sari. 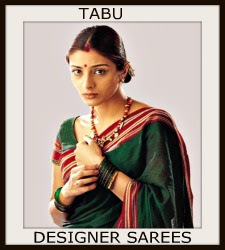 Orange colored saree with printed works and plain border. 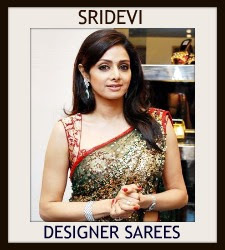 Paired with round neck blouse with quarter sleeves. 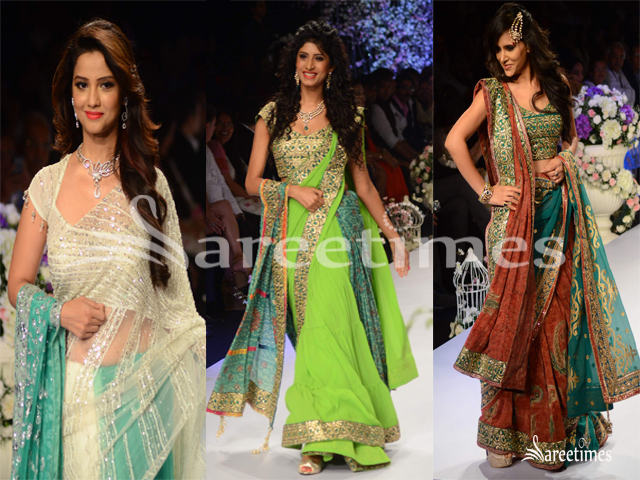 Models walked for designer Suneet Verma at Blenders Pride Fashion Tour 2014. 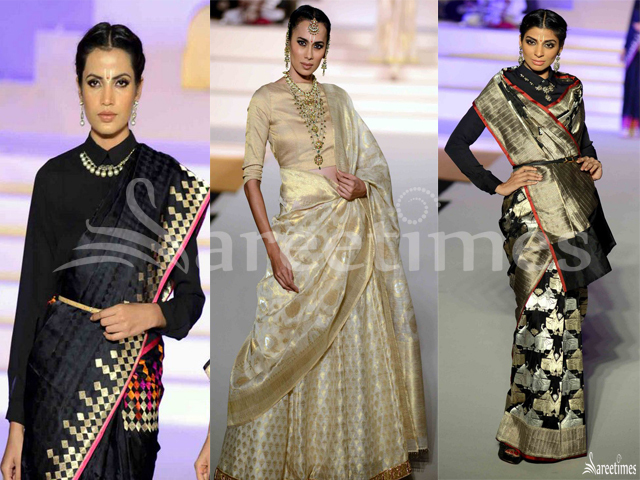 Models walked for designer Shivan and Narresh at Blenders Pride Fashion Tour 2014. 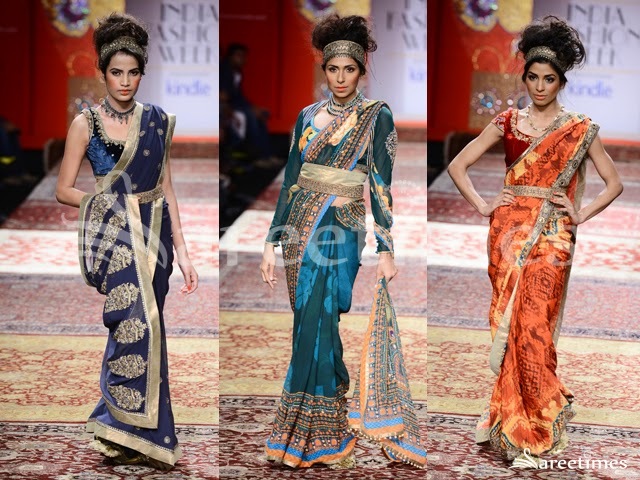 Models walked for designer Neeta Lulla at Blenders Pride Fashion Tour 2014. 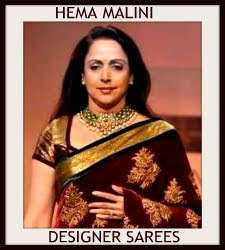 Model walked on ramp for designer Anupama Dayal at Wills India Fashion Week Spring/Summer 2015. 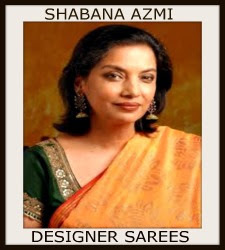 Model walked on ramp for designer Shivan and Narresh at Wills India Fashion Week Spring/Summer 2015. 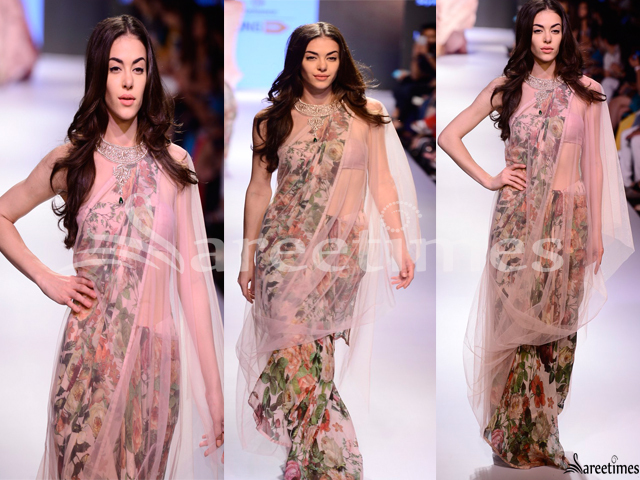 Model walked on ramp for designer Payal Pratap at Wills India Fashion Week Spring/Summer 2015.